Here is one still shot. 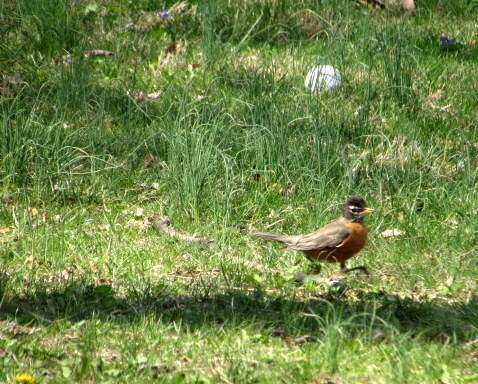 I saw this robin hopping around the neighbors yard the other day, and at first I thought nothing of it. 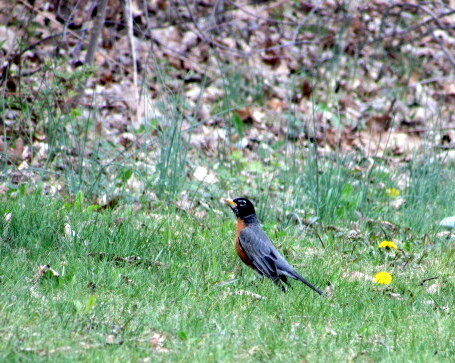 Then I noticed him pulling worms and thought that perhaps I could get a nice picture. On hands and knees, I followed him around for most of ten minutes trying to catch him in the act of pulling a worm. My wife, ever helpful, watched me and laughed. Then she hurried to get her phone and take pictures of me crawling around with a camera. I was unable to catch robin in the act. He had a clear distrust of me that kept him moving nearly as much as I did. Finally, he completed a large circle, reached a nest full of eggs, sat on them and ceased to move. It was at this point that I began to wonder if he is actually a she. I did catch him (or her) in motion for one of my shots. The rest, I am afraid, appear motionless. I finally caught it in motion. No more motion. 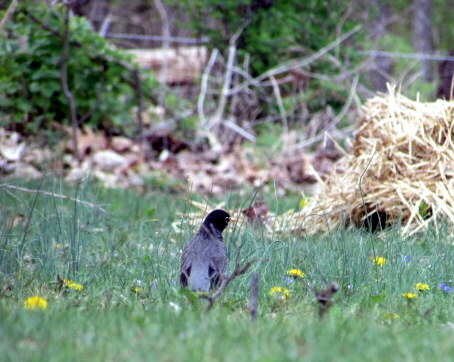 Sitting and protecting eggs in the nest. This post and these pictures prompted by WordPress’ weekly photo challenge. I’m not sure which I love most, your actual pictures or the mental imagery of you taking the pictures. 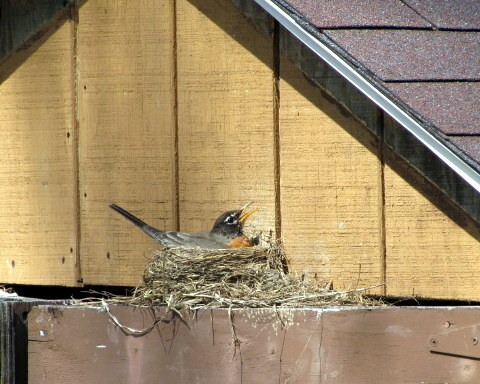 I rarely see a great picture of a robin on the nest…great job! Thank you. I told my wife that I wasn’t excited about seeing those pictures appear online. I am sure I made quite the humorous picture. I probably wouldn’t want them online either, but when I next see your wife I hope she still has them on her phone. And we all make humorous pictures at times. You’ll be reading about mine very soon.